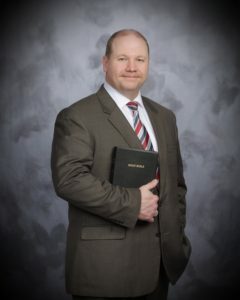 As a young man, born and raised in East Tennessee, I had the precious opportunity to hear the Word of God; which led me one night to the realization that I was a sinner and that without salvation my eternal destination would be hell. Under heavy conviction, I understood that it was not my church membership, not my good works, and not even my baptism that was payment for my sins. It was under this conviction that I realized that the payment had already been paid in full by the shed blood of Jesus Christ. It was then that I believed and acknowledged that precious sacrifice. I also acknowledged my sinful state, asked for forgiveness as well as repented of my sins. In that instantaneous moment my sins were forgiven and I was birthed into the family of God. In 1996, God blessed me with a wonderful wife, Jennifer, and has blessed us with four precious children. In the year 2000, I surrendered to the call of God to preach the Word of God. It is such a privilege to serve the KING of kings and LORD of lords, and we are excited to serve in here in Billings, Montana @ Grace Baptist Church. If you have any questions, please do not hesitate to email me. I look forward to hearing from you, and I do hope that you will make plans to worship with us in one of our regular or special services. Thank you and may God bless! "The LORD is thy keeper: the LORD is thy shade upon thy right hand."